he old metal door creaks as it opens to the smell of hot tar and the glare of bright sunlight. I stand in the doorway, momentarily blinded, listening carefully for the sound of other voices or the crunch of tar paper bubbles signaling that someone is already there. Thankfully I hear neither. Stepping onto the roof, I slowly close the door behind me. I don't want it to slam and make too much noise. I know from experience to walk lightly because I don't want the people in the apartments below complaining to the super. There is a certain feeling that goes with sitting alone on this rooftop in the Bronx. It’s my safe place, one of the only places I can go for real privacy. Whenever I need to escape something this is where I go - most times by the stairs but sometimes straight from the alleyway and up the fire escape. I can still smell the acrid tar paper, and feel its hot and gritty surface beneath my feet. In the evening, as the air begins to cool, I can hear the sounds of mothers and daughters preparing supper, the din of pots, pans and dishes wafting up from the many apartments facing the alleyway, children yelling, mothers scolding, and the soft slap of wires from the many TV antennas whenever the wind blows. Lying at the roof’s edge, I can still feel that slight tingle of fear mixed with the curiosity of what it would feel like to fall. My stomach tightens and I want to back away but I don't. Looking west I watch the trains of the old Third Avenue El roll into the stop at Fordham Road. Sparks of electricity bathe the cars in an unearthly blue as the metal wheels shriek in protest against the metal tracks. Even further west I can see the clock tower on the Dollar Savings Bank way over on the Grand Concourse. I watch the sun go down behind those buildings, lighting the skies with the most beautiful pinks, purples and golds. The walls and windows of the cupola on Roosevelt High School glow a muted orange as the sinking sun reflects off the building. Mount Carmel across the alleyway is in the shadow of my building and the already orange walls get darker as the tower on the parade grounds of Fordham University catches the last fading light of the sun. I see cars as they pass and my friends as they play at some game or other. I am alone, high above their world and for some reason I feel peaceful. Here is where I come to terms with a fear known only to me and take pride in myself without concern. Here I can cry my tears and suffer through imagined heartbreaks without ridicule. There are very few places where it has ever felt so peaceful. The address or year really doesn't matter. I’m sure it was the same all over the Bronx. DUCK! and another rock sailed over our heads to bounce harmlessly down the alleyway. Another rock throwing battle had started again. I lived on 189th Street between Bathgate and Washington Avenues. 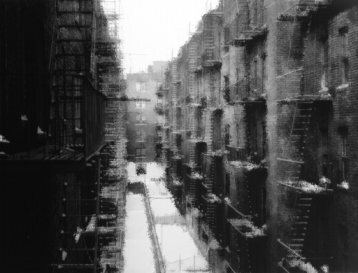 In the mid-fifties it was enough to be seen in the back alley by someone from 188th street for a fight to break out. In the center of the block, completely surrounded by apartment buildings and Mount Carmel Elementary School, stood a dress factory. It was only accessible to the workers by a long driveway that began on the 188th street side. The factory itself rested upon a mound of dirt, rocks and trees elevated from three to ten feet over the concrete of the alleyways. On the Washington Avenue side small trees provided a natural border between the 189th and 188th Street sides. Here was our battleground. Battles were fought by children and yet fought in ernest. We were all somewhere between six and eight and fairly accurate with small stones. We would hide behind the three-foot wall and fire rocks between the trees hoping to hit someone. Thankfully most of the rocks hit the trees or sailed harmlessly overhead. The battles were fought until one side ran away (very rare) or some adult started yelling at us out from one of the buildings. At other times we would break a window causing everyone to scatter. It was here that some unknown hero from 188th ran through the trees ducking our rocks till he stood atop our three-foot wall and dropped a large rock on Mikey’s head. He got away unscathed as we dragged Mikey to his mother’s and subsequently to the hospital to get the hole in his head stitched up. The conflict took years to get over. It wasn't an everyday thing but it waited in the background for that moment of opportunity. You might be sitting there melting crayons into bottle caps when all of a sudden it would rain water balloons. In latter years it would rain cherry bombs or ashcans as we grew older and more sophisticated. Then one day it just ended. I don't remember when or how. It just did. I guess we all grew up somewhat. Maybe it was because many of the guys on 188th street moved away. I don't know - but I'm glad it did. The twists and turns of the alleyways, not to mention the darkness at night, allowed all manners of little sins: making out with your girl, slugging down that illegal bottle of Gypsy Rose, or just escaping some authority figure. 189th Street sloped downhill from Bathgate. All the alleyways were at different levels. We used to be able to run straight from the alleyway at 502 to the alleyway at 490. The only thing you had to worry about were the little two or three-foot drops between buildings. In the dark it sometimes became a challenge. These little drop-downs, ideal for toy soldiers to climb or for hot-rods to crash over, became natural play zones. The landlord finally put fences up to separate the alleyways. I guess this was done to keep unsuspecting visitors from falling over the little cliffs in the dark. All sorts of hiding games and ambush games were played in these mazes of concrete and metal. Later even more interesting games were played here. All our experiments were conducted here. Blowing up spider webs and model boats with firecrackers, constructing carpet guns and later cannons with drain pipes and cherry bombs. Here was where we scraped or painted our initials for posterity, vowing to come back one day to check them out. We knew those alleys better than we knew our neighborhood. They hold many of my most pleasant childhood memories and silly as it sounds I still feel a tiny twinge of pride as I remember being an "89er", peering intently through the trees looking for a target.